Although enzymes are useful, the body must be able to control when they work; for example, enzymes involved in mitosis should be shut off when cells are no longer dividing (in the G0 phase). This may be accomplished in a variety of ways, as described below. Enzymes are often subject to regulation by products further down a given metabolic pathway, a process called feedback regulation. Less often, enzymes may be regulated by intermediates that precede the enzyme in the pathway, also called feed-forward regulation. This is clearly evident in the study of metabolism, as discussed in Chapters 9 through 12 of MCAT Biochemistry Review. While there are some examples of feedback activation, feedback inhibition is far more common. Feedback inhibition, or negative feedback, helps maintain homeostasis: once we have enough of a given product, we want to turn off the pathway that creates that product, rather than creating more. In feedback inhibition, the product may bind to the active site of an enzyme or multiple enzymes that acted earlier in its biosynthetic pathway, thereby competitively inhibiting these enzymes and making them unavailable for use. This is schematically represented in Figure 2.8, as we see product D feeding back to inhibit the first enzyme in the pathway. Figure 2.8. Feedback Inhibition by the Product of a Metabolic Pathway A high concentration of the product, D, inhibits enzyme 1, slowing the entire pathway. Negative feedback is an important topic in both enzymology and the endocrine system. Remember that most hormonal feedback loops are also inhibited by negative feedback. The endocrine system is discussed in Chapter 5 of MCAT Biology Review. There are four types of reversible inhibition: competitive, noncompetitive, mixed, and uncompetitive. On Test Day, you will most often encounter competitive and noncompetitive inhibition, but be aware of the differences in the four types. Table 2.2 at the end of this section summarizes the features of each type of reversible inhibition. The concept of competitive inhibition has relevance in the clinical setting. For example, methanol (wood alcohol), if ingested, is enzymatically converted to toxic metabolites, which can cause blindness and even death. Administration of intravenous ethanol is the treatment of choice for a patient suffering from methanol poisoning. Ethanol works by competing with methanol for the active sites of the enzymes involved. Competitive inhibition simply involves occupancy of the active site. Substrates cannot access enzymatic binding sites if there is an inhibitor in the way. Competitive inhibition can be overcome by adding more substrate so that the substrate-to-inhibitor ratio is higher. If more molecules of substrate are available than molecules of inhibitor, then the enzyme will be more likely to bind substrate than inhibitor (assuming the enzyme has equal affinity for both molecules). Adding a competitive inhibitor does not alter the value of vmax because if enough substrate is added, it will outcompete the inhibitor and be able to run the reaction at maximum velocity. A competitive inhibitor does increase the measured value of Km. This is because the substrate concentration has to be higher to reach half the maximum velocity in the presence of the inhibitor. A Lineweaver–Burk plot comparing an enzyme with and without a competitive inhibitor is shown in Figure 2.9. Noncompetitive inhibitors bind to an allosteric site instead of the active site, which induces a change in enzyme conformation. Allosteric sites are non-catalytic regions of the enzyme that bind regulators. Because the two molecules do not compete for the same site, inhibition is considered noncompetitive and cannot be overcome by adding more substrate. Noncompetitive inhibitors bind equally well to the enzyme and the enzyme–substrate complex, unlike mixed inhibitors. Once the enzyme's conformation is altered, no amount of extra substrate will be conducive to forming an enzyme–substrate complex. Adding a noncompetitive inhibitor decreases the measured value of vmax because there is less enzyme available to react; it does not, however, alter the value of Km because any copies of the enzyme that are still active maintain the same affinity for their substrate. A Lineweaver–Burk plot of an enzyme with and without a noncompetitive inhibitor is shown in Figure 2.10. Mixed inhibition results when an inhibitor can bind to either the enzyme or the enzyme–substrate complex, but has different affinity for each. 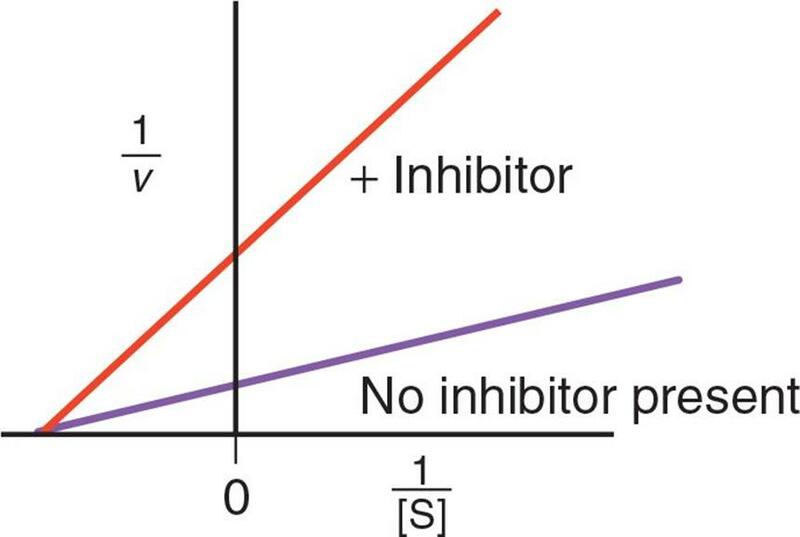 If the inhibitor had the same affinity for both, it would be a noncompetitive inhibitor. Mixed inhibitors do not bind at the active site, but at an allosteric site. Mixed inhibition alters the experimental value of Km depending on the preference of the inhibitor for the enzyme vs. the enzyme–substrate complex. 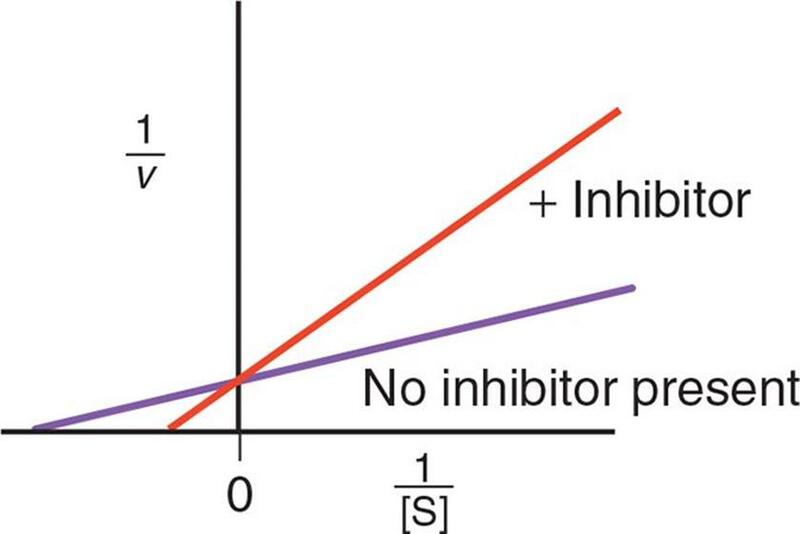 If the inhibitor preferentially binds to the enzyme, it increases the Km value (lowers affinity); if the inhibitor binds to the enzyme–substrate complex, it lowers the Km value (increases affinity). In either case, vmax is decreased. On a Lineweaver–Burk plot, the curves for the activity with and without the inhibitor intersect at a point that is not on either axis. Uncompetitive inhibitors bind only to the enzyme–substrate complex and essentially lock the substrate in the enzyme, preventing its release. This can be interpreted as increasing affinity between the enzyme and substrate. Because the enzyme–substrate complex has already formed upon binding, uncompetitive inhibitors must bind at an allosteric site; in fact, it is the formation of the enzyme–substrate complex that creates a conformational change that allows the uncompetitive inhibitor to bind. Thus, uncompetitive inhibitors lower Km and vmax. On a Lineweaver–Burk plot, the curves for activity with and without an uncompetitive inhibitor are parallel. In this type of inhibition, the active site is made unavailable for a prolonged period of time, or the enzyme is permanently altered. In other words, this type of inhibition is not easily overcome or reversed. A real-world example is aspirin. Acetylsalicylic acid (aspirin) irreversibly modifiescyclooxygenase-1. The enzyme can no longer bind its substrate (arachidonic acid) to make its products (prostaglandins), which are involved in modulating pain and inflammatory responses. To make more prostaglandins, new cyclooxygenase-1 will have to be synthesized through transcription and translation. Irreversible inhibition is a prime drug mechanism, and something that you will come across often in medical school. Enzymes that are allosteric have multiple binding sites. The active site is present, as well as at least one other site that can regulate the availability of the active site. These are known as allosteric sites. Allosteric enzymes alternate between an active and an inactive form. The inactive form cannot carry out the enzymatic reaction. Molecules that bind to the allosteric site may be either allosteric activators or allosteric inhibitors. Binding of either causes a conformational shift in the protein; however, the effect differs. An activator will result in a shift that makes the active site more available for binding to the substrate, whereas an inhibitor will make it less available. In addition to being able to alter the conformation of the protein, binding of activators or inhibitors may alter the activity of the enzyme. As shown in Figure 2.6 above, Michaelis–Menten plots of cooperative allosteric enzyme kinetics often have a sigmoidal (S-shaped) curve. In addition to transient interactions, enzymes are often subject to covalent modification. Enzymes can be activated or deactivated by phosphorylation or dephosphorylation. One cannot predict whether phosphorylation or dephosphorylation will activate an enzyme without experimental determination. Glycosylation, the covalent attachment of sugar moieties, is another covalent enzyme modification. Glycosylation can tag an enzyme for transport within the cell, or can modify protein activity and selectivity. Specific mechanisms for the modification of enzymes by glycosylation are still being studied, and are beyond the scope of the MCAT. Certain enzymes are particularly dangerous if they are not tightly controlled. These include the digestive enzymes like trypsin, which, if released from the pancreas in an uncontrolled manner, would digest the organ itself. To avoid this danger, these enzymes and many others are secreted as inactive zymogens like trypsinogen. Zymogens contain a catalytic (active) domain and regulatory domain. The regulatory domain must be either removed or altered to expose the active site. Apoptotic enzymes (caspases) exhibit similar regulation. Most zymogens have the suffix –ogen. Consider that digestive enzymes, discussed in Chapter 9 of MCAT Biology Review, chew up fats, proteins, and carbohydrates—the very same compounds of which our body is made. How do these enzymes know to digest your food but not your body? Simply put, they don't! So, we regulate their activity in a coordinated manner using feedback mechanisms and other substances. 1. What is feedback inhibition? 2. What are the four types of reversible inhibitors? 3. What is irreversible inhibition? 4. What are some examples of transient and covalent enzyme modifications? 5. Why are some enzymes released as zymogens?